Next: USED CONDOMS: DELICIOUS PARTY SNACK OR HEALTH HAZARD? Josh Carmen has a big problem with Montreal's party scene. "I don't understand where ravers got the idea that giving cocaine to their dogs is okay," says Josh. "It isn't. Giving coke to your pets is never okay. Not only is giving cocaine to your dog illegal, it is also very dangerous and incredibly bad for their health. 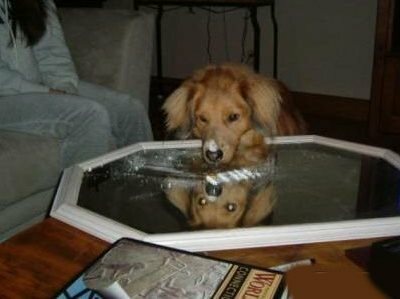 If you love your dog, don't give them cocaine." Dog Parties are the latest fad among Montreal ravers. Their origins remain a mystery, but their popularity can't be denied. Alisha Rezzo has thrown several of them over the last six months. "I know veterinarians disagree, but none of the dogs at our parties have died. They love getting high, and we love getting high with them. You know how much fun it is to get stoned with your friends? Well, it's even more fun to get stoned with man's best friend. Don't knock it until you've tried it. Dancing in a room full of coked up labradoodles is a one of a kind experience. It's blissful. Therapeutic even." Josh Carmen isn't buying it. "Dogs aren't humans. If you give them cocaine and lock them in a room for twelve hours where loud music is being played non-stop, you are going to scare them. Ravers should be thankful that none of these dogs have attacked them yet. Because it's going to happen. Sooner or later, one of these dogs is going to snap, and it will kill a raver." Alisha thinks Josh is overreacting. "Josh might have studied dogs, but he's never partied with them. Instead of dissing our parties, he should try attending one. The dogs love it. Dog parties are bringing PLUR back to the rave scene. Dogs bring out the best in people. It's a lot easier to feel peace, love, unity, and respect for each other when the dance floor is full of wagging tails."